The Academic Chef: Weekend Visitors from Nashville! Last fall my cousin and her wonderful husband were married in Tennessee and this fall we were all lucky enough to have them visit us up in NH! It was such a fun family weekend, and in this family - fun weekends are full of great food! My parents hosted a fabulous anniversary party at their house - and thanks to expected bad weather, family friends provided a fantastic tent for the day! Pizza, salad, chili, pulled pork and chicken, corn chowder - what a spread we had! As for the entertainment - last year's wedding video screened on the top of the tent! 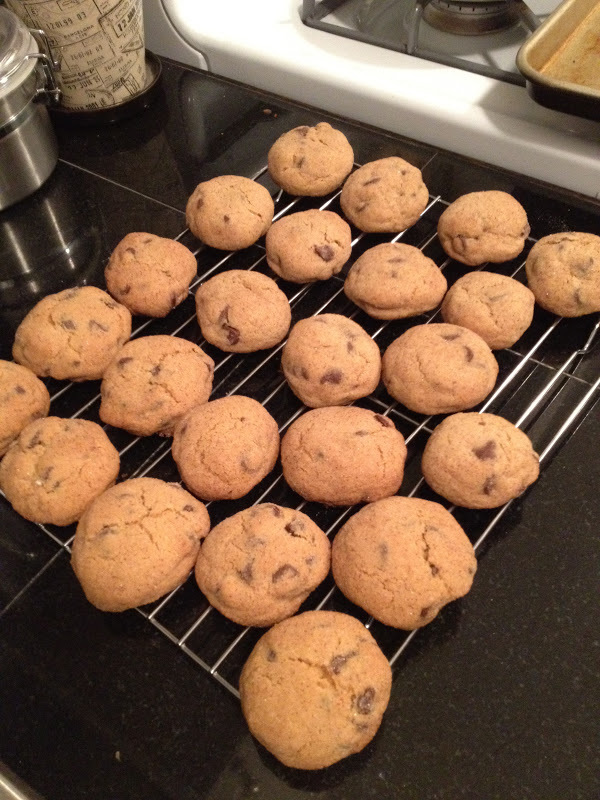 I made my Chocolate Chip Snickerdoodles for the party, which I first made in August of last summer. This time they came out much taller/fuller but they were a hit at the party still! This recipe lends itself particularly well to freezing. I knew I would busy the few days before the party so I made these earlier in the week and froze them immediately. The next day we did a little family apple picking and although our intention was to use the bounty for baking, the kids' plans won over and the group set out to make candy and caramel apples. I forgot how much I disliked these apples - you can't chew them at all, the caramel sticks to your teeth and the poor apples that were just picked from a tree are now covered in sugar! Next time, good old traditional apple pie it is! Our visitors wanted to drive up the coast of Maine, which is a trip I did with visitors over the labor day weekend so I had this all planned out already! 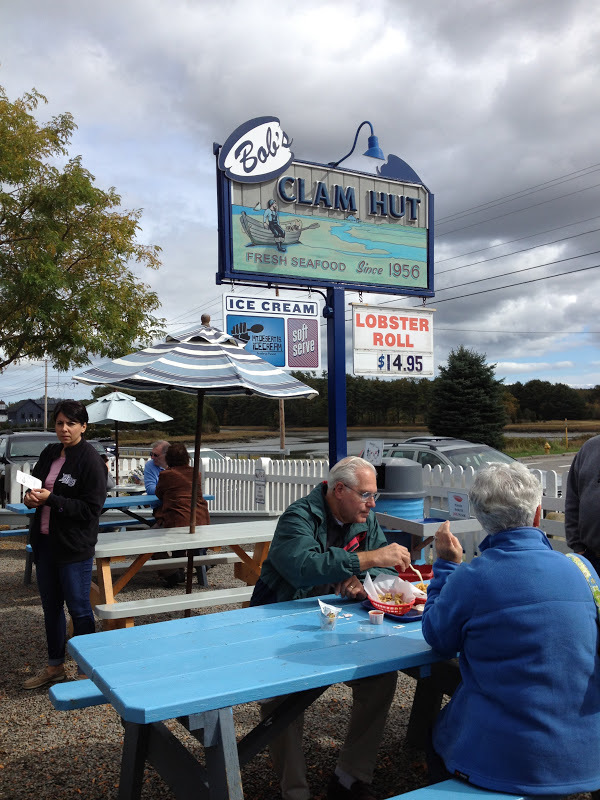 High on the priority list was getting some good seafood so we stopped in Kittery on our way up the coast at Bob's Clam Hut. This is the first casual seafood spot coming up the coast when you get off the highway for the outlets, so I think the prices reflect that. Everyone enjoyed the food and the portions were good size, but it was busy and I think the off-the-beaten path places are inevitably going to be better choices. I tried their fish chowder, which was thin and not too creamy thankfully. 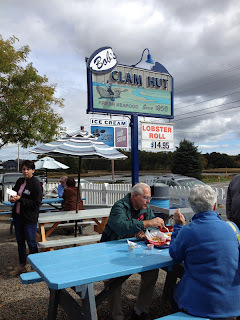 Everyone really enjoyed the fried clams and my mom really enjoyed her fish sandwich. We were also very impressed with the service - everyone was so helpful and friendly. The foodie highlight of the weekend was making homemade pasta! My cousin even shipped her pasta making equipment up here since we didn't have the right attachment for the kitchenaid mixer. Given how big the family is, we were attempting to make fresh pasta for like 15 adults and 2 kids. That's a lot of pasta - and as you can see, we had to get creative about where to hang the pasta while it dried. 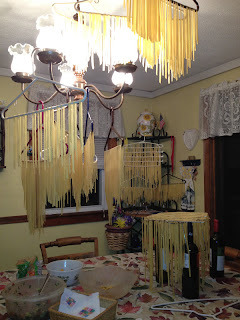 Cleaned off coat hangers seemed like the best option and so, we started hanging pasta all over the kitchen! It was quite the scene - like you were walking into a pasta making shop in Hampstead. While we were waiting patiently for the pasta to dry, we had my lentil and avocado salsa for the first time (which was a big hit!) and other snacky items! We created a sort of pasta bar with different sauces and proteins - so our family had the option of red sauce, meatballs, pesto, alfredo with broccoli or sausage cacciatore! We could definitely open our own restaurant! If only our dear family down in TN and FL lived closer year-round! Looking very much forward to the next family reunion! Kerri and Adam - Congrats on your first year of wedded bliss and we're looking forward to celebrating many more! Ed.M. Higher Education and B.S. Management and Global Perspectives ... More importantly, I probably should've gone to cooking school. I grew up in a house where everything was made from scratch and thanks to my mother, I've inherited that attitude about cooking! While I love working in higher education, I have an equal love and passion for cooking. I'm here to share my recipes and cooking journey with you! The Academic Chef 2011 by Elise Noel. Simple theme. Theme images by luoman. Powered by Blogger.